Eight steps to the pool and another five to the beach...can you imagine anything more enticing? Our Sandbox is the 'storybook' vacation!...5,000 SF or 'Everything-Beach'. All bedding, kitchen supplies (including a staples-stocked pantry), entertainment (game room, music & internet, etc), pool & beach items (umbrellas, chairs, boards, floats, etc), expandable dining options (including outdoor dining), sun-worshiping chases, bikes & jogging stroller, BBQ, multiple kitchens & laundry facilities and much more! Our Sandbox is professionally decorated and managed. It is maintained in superior condition (not easy for ocean-front homes) and, when available, provides an amazing vacation environment that will exceed all expectations! Three king bed suites; four twin bed suites; two sofa convertibles; seven full bathrooms; two kitchens; split plan...dressed in traditional beach decor with a cloak of whimsical creativity! New Smyrna Beach is still considered 'sleepy' by most Florida standards...that's what we love most about it! The moist beach sand is perfect for sculpting the most challenging castles...while the silky, white dunes sand caress your toes while strolling the miles and miles of coastal beauty. Unlike other Atlantic town beaches...you'll find no cars touring on our beach area...nothing but children frollicing in the sand, surfers taming their waves, shell-hunters and romantic's strolling next to the rambling waves...all you can imagine is here at the Sandbox! Welcome. White sand beaches await you in New Smyrna Beach...sand-cities are easily sculpted...bike riding, strolling or jogging on miles and miles of beach is simply wonderful here. We are a family of four living in Central Florida. We purchased and completely renovated our beach home a few years ago to create a 'retreat' to escape the craziness of our lives in Orlando. The Sandbox is an amazing place to relax and unwind, whether its just the two of us, our family, or a get-together with extended family/friends. The Sandbox is not your ordinary beach house...it breathes life into you and invites you to enjoy its surroundings. You will immediately succumb to its serenity! We know you'll enjoy our Sandbox as much as we do -- welcome to the beach! 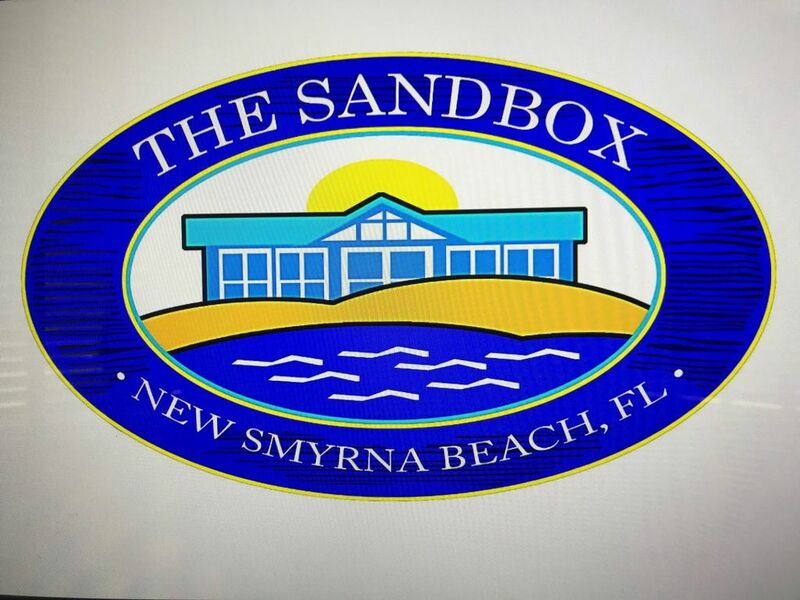 The Sandbox is located about an hour from our home near Orlando (and Disney, Universal, Sea World, water parks, etc) and is just down the beach from Daytona Speedway & Kennedy Space Center. Finding a home that can accommodate large families or groups under one roof is challenge enough; finding one that has our ocean views and accessibility, spacious pool, pristine beaches, amenities, etc? Well, that's just rare! White sand beaches await you in New Smyrna Beach. Whole sand-cities are easily sculpted, while bike riding, strolling or jogging on miles and miles of beach is simply wonderful here. Our beach home is situated directly on the beach and accessed from a quiet, unassuming, residential street. We have no immediate neighbors and are located at the end of the street for amazing privacy. We do benefit from a lifeguard station only three lots away (stationed in-season only), and still have amazing restaurants and shopping just up the street (one just a short walk away). We find many of our guests enjoy the sandbox for family gatherings as it allows ample room for everyone and large central gathering areas for the whole family to enjoy together. Amazing Atlantic views on one side and glorious sunsets on the other! The Sandbox sits directly on Florida's most beautiful beach! No climbing over thorny-weed dunes to get to the beach! The Sandbox is right on the beach! All bedrooms have a ocean view at the Sandbox! Surfing, fishing, boogie boarding or just cooling-off in the deep blue ocean...its right outside your door! Water views from all bedrooms! Three 'zoned' air conditioning systems for complete distribution. Complete linens and bath towels for multiple changes & restock. Beach towels on-site too! Two washers! One on each floor. Two dryers! One on each floor. Parking on-site for 8 automobiles! Garages reserved for storage, stroller, BBQ, ping pong table, etc. Two living rooms...one upstairs and one down, both with seating for large groups! Two (2) dishwashers available for guest use (one per floor). Two (2) new (2013) refrigerators available for guest use. Two (2) microwave ovens available for guest use (one per floor). Three (3) coffee makers (2 on first floor, 1 on second). Many staples provided in large walk-in pantry (suggest you view before you shop). Large well-stocked kitchen, many utensils, pans, serving items, cookware, storage. First floor: Dining table seats 12-14, Kitchen breakfast bar seats 4. Second floor: Dining table seats 6, Kitchen breakfast bar seats 4, Outdoor covered: 2-tables seat 6 each, kids' picnic table. TVs in each living area plus every bedroom (except one). Upstairs CD stereo in dining foyer cabinet. Books located on first floor in library-nook. Foosball, mini-pool, air hockey, indoor basketball, ping pong, etc! Many, many games for all ages...located thropughout the house. CD options located upstairs near stereo. Sprawling balcony facing the ocean...amazing sunning opportunity with chaise lounges awaiting. Very large covered veranda overlooking pool & ocean with two dining tables seating 6 each. Boogie boards, floats, toys, etc. In most areas...please inquire with owner for details. Very large pool located between house and beach. Please note there is no child-pool-fence on property. Please monitor all non-swimming children at all times! Thank you for sharing your home with us. We enjoyed everything from sun, surfing, sand, manatee, fishing, paddle boarding, good food, great restaurants and topped it off with a great night sleep. The house was well appointed with comfortable bedding and furniture with plenty of room for everyone. There is nothing like waking up to a spectacular sunrise over the ocean right from your bed! We hope to be back soon! The owners of the beautiful property were overly accommodating. HIGHLY RECOMMEND!! Great and well-equipped space on the beach for our large family! Right on the fantastic beach and with a pool! We rent on the coast annually and until now thought a pool was unnecessary. Our experience at The Sandbox convinced us otherwise. Appreciated the well equipped home, ample parking, and a close public access ramp suitable for wheelchair access. Beach side offered a patio that was partially covered, nice for those who wanted to be outside but out of the sun. Our extended family, including 7 adults and 9 kids enjoyed our stay at the Sandbox very much. The location is perfect for families - very residential area with lifeguard stand nearby and the beach was never crowded in front of our house. We enjoyed the pool and the layout of the house as well. The kids were continually entertained between the beach, pool, and game rooms. The house was well equipped with everything we needed including sand toys, boogie boards, towels, and kitchen utensils. The outdoor seating was comfortable and great for our large family and numerous children. The owners were great to work with - couldn't have been more helpful! We would highly recommend this house for your next family getaway! Our family of 18, ages 7 mo. to 67 years, spent the most wonderful spring break at the Sandbox. This beautifully decorated beach house is steps away from the beach offering gorgeous views from almost every room. Our 8 grandchildren loved the surf and spent hours boogie boarding and body surfing. The younger ones built sand castles & played with the abundance of beach toys. Everyone loved the pool and its accessibility to the house and the beach. This home is so spacious and well laid out that all 5 families had their "own spaces". The kitchen was stocked with everything that you could possibly want, including blenders for our margaritas. The island was a perfect eating area for the kids while the 10 adults enjoyed conversations in the large dining room with a clear view of the kids. Evenings were spent in the game rooms (2) with ping pong tournaments, air hockey and other games. We loved our time at the house so much that we never left. We have to return to New Smyrna Beach to explore the cute town and sites in the area. The only thing missing was a sunset but those sunrises were amazing! We are definitely returning to the best "Sandbox" ever. Thank you so much to the owners for being so accommodating. The Sandbox is a beautiful home and is very well equipped. My family loved it so much that we did not feel the need to do any sight seeing or other activities. My seven grandchildren loved the pool the beach and in the evening put the adults to bed and stayed up playing games. Beach, Shopping, Restaurants, Fishing, Surfing, Pool, Sleeps 17+/-, 5,000 Sf House, Disney & Universal 1 Hour away, Family Reunions, Corporate Retreats, Professionally Decorated, New Condition, Professionally Managed, Game Room, Pool & Beach Chairs Provided, Split-plan, Beautiful!!! Located Just South Of Daytona...Easy Access From Orlando. A Credit Card Use Fee (Administrative Fee) is applied if guest books through HA/VRBO site and uses a credit card. This fee is imposed to offset the 3% cost charged by the credit card company to homeowner. Cancellation policy: 90% refund if canceled more than 270 days prior to check-in. 60% refund if canceled 180-270 days prior to Check-in. 20% refund if canceled 90-180 days prior to cancellation. 0% refund if canceled less than 90 days prior to check-in.